Want to enjoy some of the best air in China? Teach English in Yunnan! Kunming is the capital city of Yunnan province in southwest China and has over 10 million people. Yunnan province is well known for its natural resources and gorgeous natural environment. The climate is relatively mild all year round and the province is not as densely populated as other places in China. 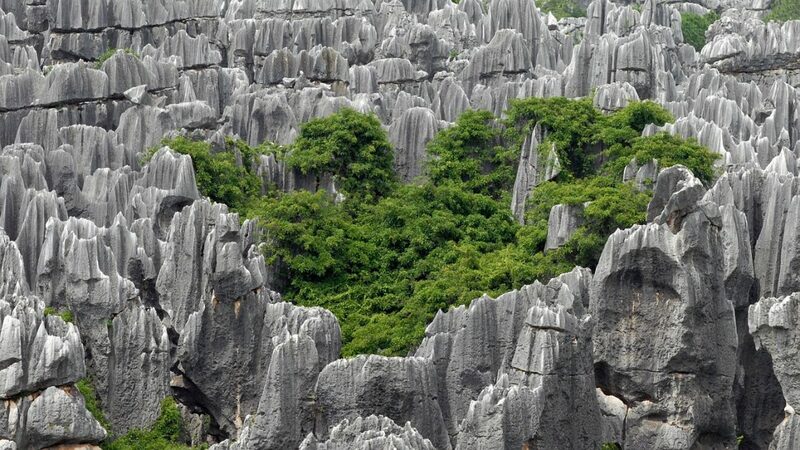 If you’re into interesting nature-formed shapes and geology, Stone Forest is a lovely 400km area to wander through. It’s about an hour outside of Kunming central and will take a full morning to walk through. If you still have energy you can head over to Juixiang scenic park which is about 30 minutes away. This area features some great caves, an underground canyon and waterfalls. If you are ever in Kunming, visiting the Stone Forest is a must do. It’s also a very cool place temperature-wise during the summer. Kuming has a 1200-year-old Buddhist temple which makes for a great spot to visit if you’re a fan of history or Chinese culture. It’s the only Buddhist temple in town and a peaceful place to wander around on the weekend. There’s a lovely pavilion in this park that was built in 1890 and from the third level, the pavilion allows for great views of Dianchi Lake. Spend the day biking around the lake or hiking in the nearby Western Hills. The city wall in Jianshui was built over 600 years ago and the buildings there are reminiscent of ancient days. There are several old wells there that have excellent tasting water. Once you’ve spent enough time in Jianshui, you can catch a bus to nearby Tuanshan which is know for it’s wood carving and equally old buildings. If you’re a photographer, you won’t want to miss Dongchuan in May through June and also September to November. The multi-colored fields against a backdrop of rolling hills and blue sky are a photographer’s dream! This is another lovely park filled with ancient temples, buildings and trees that are hundreds of years old! These tiered fields of rice have been recognized by UNESCO as a unique land sculpture. As there are several great vantage points you can choose to get those perfect photos of this awe-inspiring view, it’s probably best to hire a personal driver to take you to each spot. Locals suggest coming between January and March if you want the most remarkable shots.